Reporting from Washington — High-powered assault weapons illegally purchased under the ATF’s Fast and Furious program in Phoenix ended up in a home belonging to the purported top Sinaloa cartel enforcer in Ciudad Juarez, Mexico, whose organization was terrorizing that city with the worst violence in the Mexican drug wars. Torres Marrufo, also known as “the Jaguar,” has been identified by U.S. authorities as the enforcer for Sinaloa cartel chieftain Joaquin “Chapo” Guzman. The Fast and Furious weapons were found at one of Torres Marrufo’s homes April 30 when Mexican police inspected the property. It was unoccupied but “showed signs of recent activity,” they said. The basement had been converted into a gym with a wall covered with built-in mirrors. Behind the mirrors they found a hidden room with the Fast and Furious weapons and dozens more, including an antiaircraft machine gun, a sniper rifle and a grenade launcher. 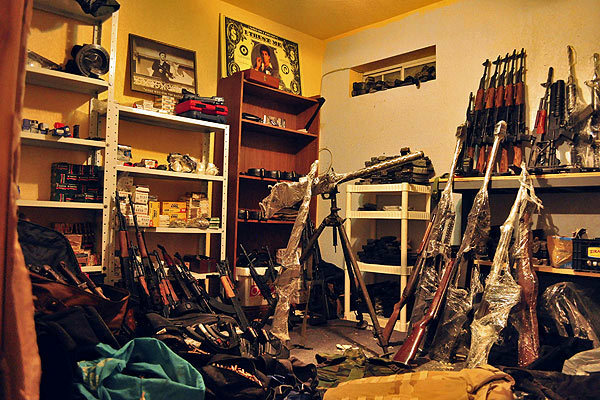 “We have seized the most important cache of weapons in the history of Ciudad Juarez,” Chihuahua state Gov. Cesar Duarte said at the time, though he did not know that many of the weapons came from the U.S. and Fast and Furious. Torres Marrufo has been indicted in El Paso, but authorities have been unable to locate and arrest him. In the U.S., intelligence officials consider the Sinaloa cartel the most powerful drug trafficking organization in the world. Weekly reports from U.S. intelligence authorities to the Justice Department in the summer of 2010, at the height of Fast and Furious, warned about the proliferation of guns reaching the Sinaloa cartel. Under Fast and Furious, begun in fall 2009, the ATF allowed illegal buyers to walk away with weapons in the hope that agents in Phoenix could track the guns and arrest cartel leaders. Sandoval pleaded guilty in federal court in El Paso and was sentenced to 6 1/2 years in prison. A month later, on Dec. 17, 2010, he escaped from a minimum-security prison in Tucson; officials believe he fled to Mexico. Two others, Ivan Chavira and Edgar Ivan Galvan, were subsequently charged in that gun recovery, along with the recovery of 20 Fast and Furious weapons on April 7, 2010, in El Paso. Those guns also were discovered by chance by local authorities, and ATF trace records show that the weapons were purchased in Phoenix two weeks before they were found in El Paso. Chavira and Galvan pleaded guilty. Chavira received eight years in prison; Galvan is to be sentenced next month.